The academic debate concerning a ancient papyrus that is said may imply that Jesus had a wife has been furthered somewhat by a statement made by Vatican that the Jesus’ wife papyrus is a ‘clumsy fake’. Although I am a Protestant theologian and rarely take the claims of Rome seriously, I think they got this one right. After all, the Vatican library does boast 75,000 ancient codices, so I think on this, they are more than qualified to make such a statement. And even if many would ignore their claim or redicule the Vatican as the home of a messy religion, such would only be a distraction from the issue at hand. "'Gospel of Jesus' wife' fragment is a fake, "Jesus Wife Papyrus Is Fake", "VATICAN CITY", Jesus's wife papyrus denounced by Vatican newspaper as a clumsy fake, The Vatican newspaper ", Vatican says"
A while ago I viewed an ancient Bible known as “The Wicked Bible”. The word in question which was missed out was the word “Not“. Thus the text read, “Thou shalt commit adultery” for which the printer was fined £300 and the run of prints were destroyed and the printers license was taken from him. 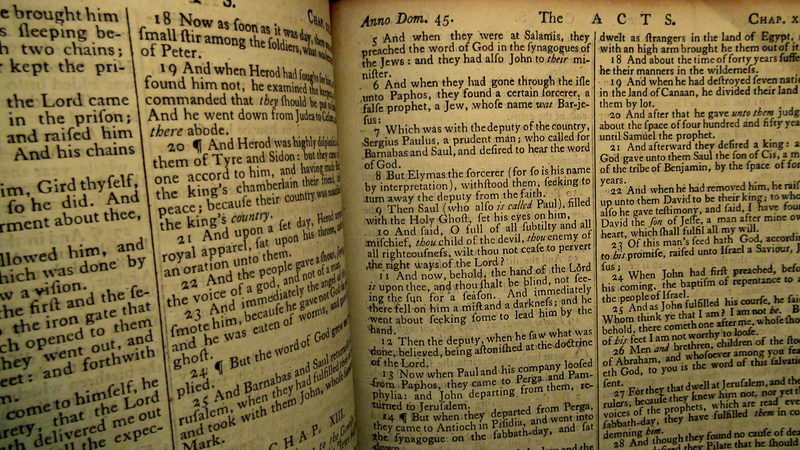 Only a few of these Bibles exist today, since they were destroyed. But as I stood looking at this surviving witness to such a massive error, it came to me of how valuable every word of scripture truly is. That if “one dot or tittle” be removed, then it will have devastating eternal effects. I prayed for the church in England and America while thinking of how far she has fallen today, when the Bibles that so many Christians hold and regard as worthy of being called a Bible, actually have edits and large numbers of texts and words missing from them. And thus so much of today’s church has gotten into bed with a harlot and has committed adultery with her, by embracing many ‘wicked Bibles’. Seems to me that we not only have individual leaders within the Christian church who are likewise guilty of this sin by accepting edited Bibles, but she is also guilty of adultery too. It is she who so often accepts sins and re-interprets the Bible to comply with modern blasts of wind and thus so often makes herself look like a people pleasing coward in the eyes the world and an adulterous bride through the eyes of her Husband. Did Jesus have a wife? The Papyrus may well be a fake! Over the years the debate has raged somewhat concerning the question of whether or not Jesus was married. I personally, after reviewing the evidence from the New Testament, historical texts and reliable history see nothing to suggest that Jesus was married. Recently we have heard of an ancient manuscript which has come to light which may claim that Jesus was married? The manuscript itself appeared to be 4th century AD? Which if so, could date the composition of the document anywhere up to 300 years after the life of Jesus. Hardly reliable history? However, after looking at photography of this manuscript, I noticed that something did not appear consistent when compared with other authentic manuscripts. Having viewed authentic manuscripts such as P52. Rylands library papyrus (50-125 AD) also known as “St Johns Fragment” and other ancient Biblical and apocryphal manuscripts at Rylands, I could not help but find the current manuscript which claims that Jesus was married, suspect. However, Professor Mark Goodacre of Duke University has published an article by Professor Watson on this matter. Here are two links to that article. "British-scholar-says-papyrus-claiming-Jesus was married is fake", "Did Jesus have a wife", "Duke University", "Durham University", "Gospel of Jesus' wife is fake", "Mark Goodacre", "Professor Francis Watson", "The Gospel of Jesus' Wife: How a fake Gospel-Fragment was composed by Francis Watson", "Was Jesus married", Papyrus fragment"
According to the article “The Israel Antiquities Authority (IAA) and Jerusalem archaeologist Eli Shukron announced the discovery of a large First Temple period reservoir” on 09/06/2012. This discovery will improve our understanding of the 1st Temple period in Jerusalem.